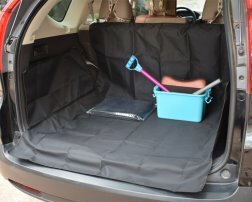 Oxford Cloth Scratch Proof / Water Proof Washable Car Cargo Cover For Dogs and Cats & Pets [CAR005969] : Onchee.com - the accessory shop for all your handheld Electronics! Your dog loves to ride in your car, but you don't love the mess he leaves! This Cargo cover is made for you both. Your dog will be comfortable, and you won't have to worry about dirt, dander or claw marks in your car. - Suffocation WARNING: to avoid danger of suffocation, keep this plastic bag away from babies and children. Do not use this bag in cribs, beds, carriages or playpens. This bag is not a toy! - Material is not fire-proof or fire-resistant. Recommend caution with heated seats or very hot places. - Net Weight: 600g approx.